HSV has expanded its Colorado SportsCat line-up with the Look Pack. Holden Special Vehicles has introduced yet another Colorado SportsCat variant, this time adding the Look Pack to its line-up. The Look Pack adds the bodykit from the SportsCat+, as well as a bunch of that model’s off-road gear, but it misses out on its rear de-coupling anti-roll bar and premium AP Racing brake package. That means the Look Pack includes some of the visual flourishes of the SportsCat+, such as its unique fascia, grille, fender flares, bonnet bulge, hard tonneau and 18-inch forged alloy wheels. It also shares the HSV Sports Suspension, a unique ESC tune, high ride height, wide wheel track and Cooper Zeon LTZ sports all-terrain tyres. The Look Pack also carries over the SV sports seats in Jasmine leather and Windsor suede from the SportsCat+. Pricing for the Look Pack is $62,490 excluding on-road costs for the six-speed manual, which is a $1700 premium over the entry-level SportsCat. Opting for the six-speed automatic adds $2200 to the price. The SportsCat+ is priced from $66,790 for the manual. HSV says that production has already commenced at its Clayton, Victoria manufacturing facility for the Look Pack, which is also available in the new ‘Crush’ orange exterior hue. The Look Pack is offered with a number of options including Active Select for the six-speed auto ($2200), a sail plane ($1300), prestige paint ($550) and a tub liner ($300) among other things. As with all other variants, the Look Pack is powered by the 2.8-litre turbo-diesel four-cylinder engine delivering 147kW of power and either 440Nm or 500Nm of torque in manual and automatic guises respectively. Last month, HSV introduced the special-edition Colorado SportsCat R that added more aggressive elements to the bodykit, such as gloss black flourishes and six-spoke alloy wheels. Just 98 examples of the R were made available, and pricing was set at $65,990 plus on-road costs. 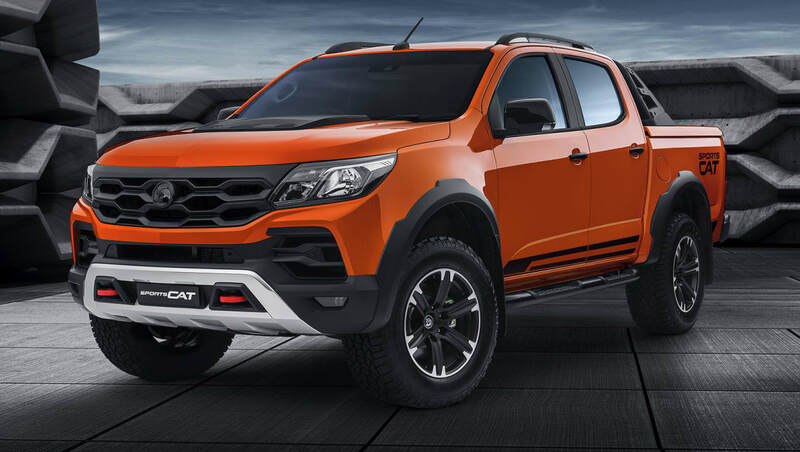 Would the HSV Colorado SportsCat Look Pack entice you out of a Ford Ranger Raptor? Tell us what you think in the comments below.